Pressing issues were discussed during the panel discussion at the 2nd International Rhine Round Table. 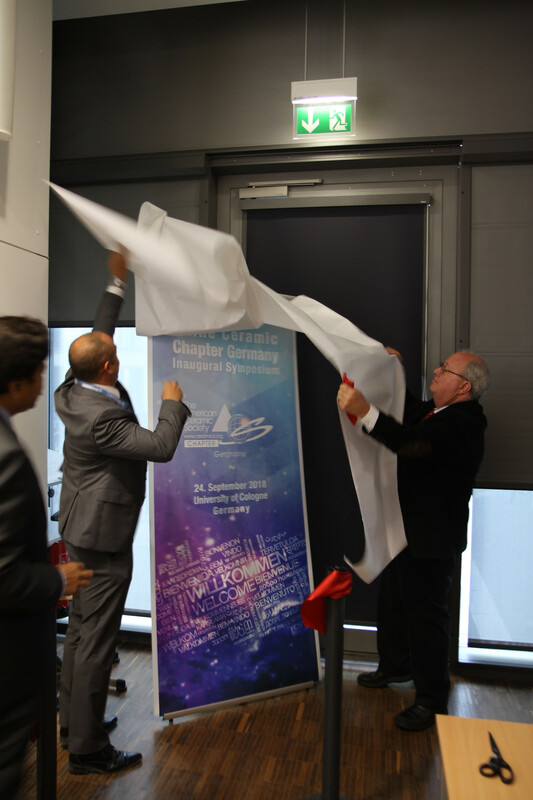 The Rhine Ceramics Chapter banner was revealed during the official funding of the chapter by ACerS President Mike Alexander. and the dean of the faculty of mathematics and natural sciences, Prof. Dr. Günter Schwarz. 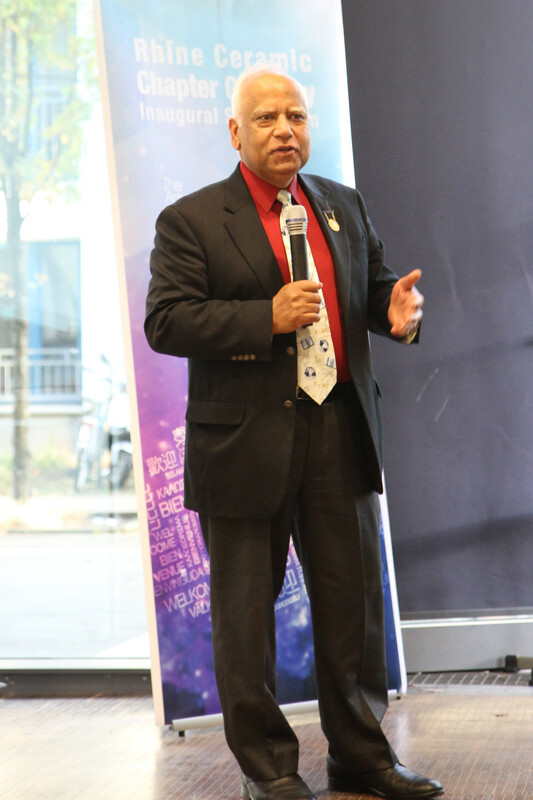 Past president Dr. Singh during his closing remarks at the 2nd International Rhine Round Table 2018. Many interesting talks were given by representatives from a variety of international societies and universities active in the field of ceramics research. During the social event, young professionals, students and established international researchers got connected. If you are lucky, you even had the chance to visit one of the annual meetings and present your research results in front of an expert audience in your research area. But did you ever ask yourself, how these national and international societies differentiate? Or how being a member of a specific society will support you finding a job in industry? Or what the future missions of these societies look like? Maybe a simpler question, like: How do I get a funding to attend the annual meetings? 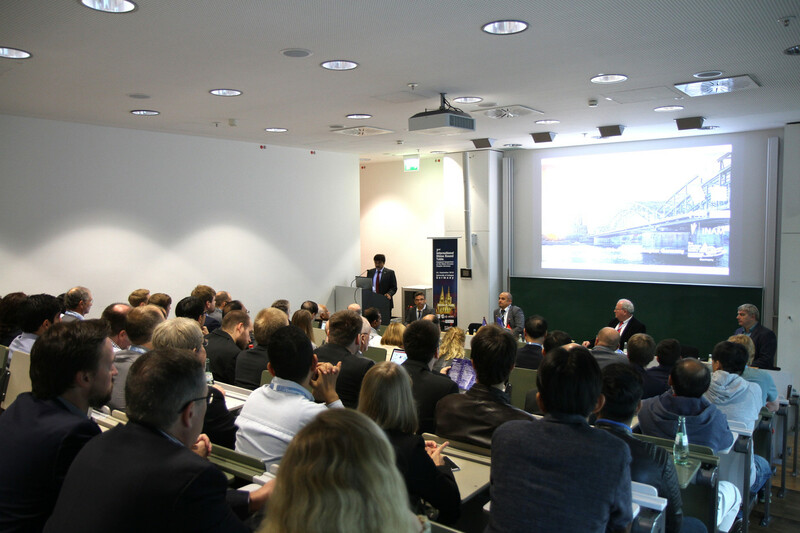 These questions and more were discussed in the scope of the 2nd International Rhine Round Table from September 23-25 at the University of Cologne in Germany. Representatives of all above mentioned research societies and in total 40 distinguished professors from 13 different countries, associated at universities, research institutes, national labs and industrial companies got together to give pitch talks on the mission, activities and future perspectives of their research society or research group. Over 40 additional postdocs, PhD and Master students attended this three day workshop, which included social and networking events, round table discussions, lecture sessions, lab tours and a collaboration workshop. But back to day 1: This meeting started with a social event in the city heart of Cologne - a tour through the famous Cologne Cathedral. Especially exciting for materials scientists- the modern stained glass window consisting of 11263 randomly arranged glass squares in 72 colors, which change their color depending on the incident light. With the unsettled weather in Cologne, it is rather exciting to plan an outdoor event, but being equipped with rainbow-colored umbrellas and energized by one Gaffel Kölsch- a typical Cologne beer- the boat trip on the Rhine River was a successful group event. The networking dinner in the old town of Cologne allowed to discuss challenges in the modern society and how to solve contemporary problems with the help of materials science. 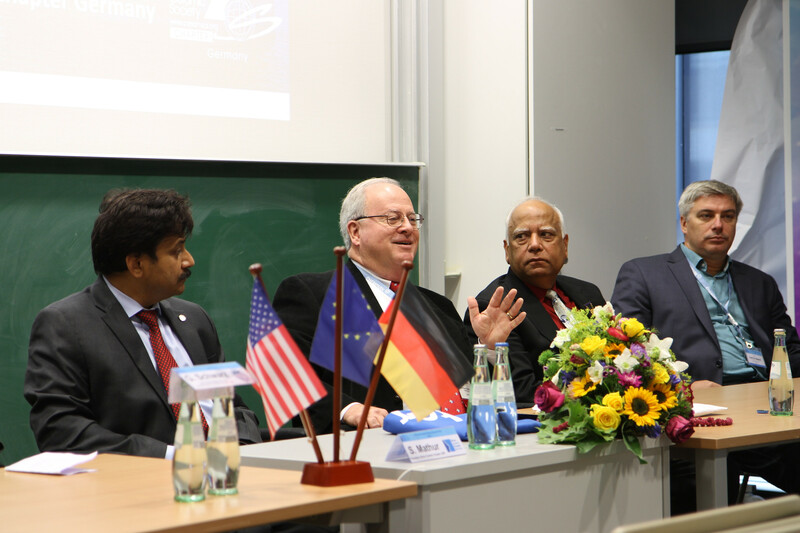 The official program started with introductory words of Prof. Dr. Sanjay Mathur, advisory board member of the World Academy of Ceramic and organizer of this event as well as the dean of the Faculty of Mathematics and Natural Sciences at the University of Cologne, Prof. Dr. Günter Schwarz and ACerS president Mike Alexander, who inaugurated the Germany Chapter of The American Ceramic Society in a ribbon cutting ceremony. 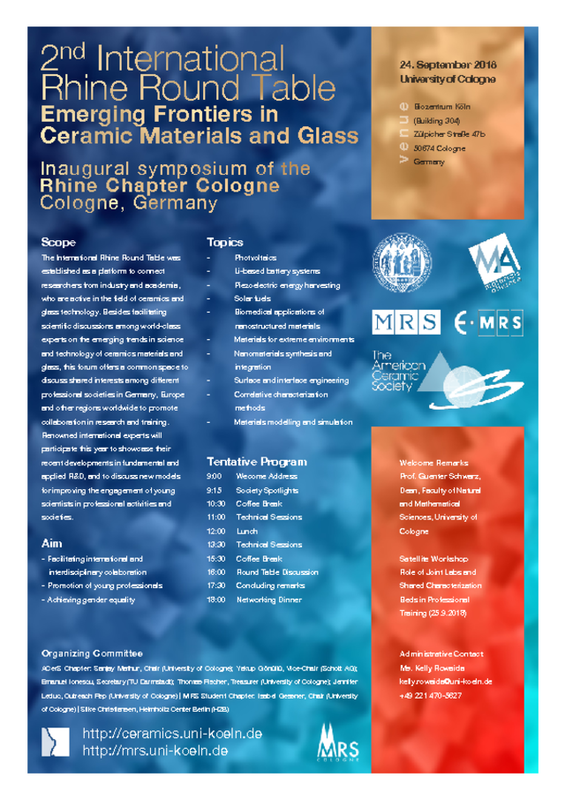 This ACerS chapter consists of members in or near the cities of Cologne, Bonn, Aachen, Düsseldorf, and Dortmund for the purpose of promoting the arts and sciences connected with ceramics and glass science and engineering. The ceremony was followed by a vivid round table discussion with representatives of the MRS, ACerS, ECerS, DGM and DKG. The panelists talked about their future visions and programs supporting young talents in their early career stage but also addressed critical questions concerning gender equality, budgets to support African universities or grant distribution of national funding agencies. During the Society Spotlights session all panelists had the chance to talk in more detail about the reflections and directions of their research society with focus on innovation and societal challenges. The second session mainly included speakers from industrial companies, who talked about opportunities to bridge the innovation chasm between university and industry as well as business strategies and data exploitation. The last session concentrated on specific research approaches to target materials related challenges. During the coffee breaks, which were kindly sponsored by TCI Deutschland GmbH, the students had the chance to get in personal contact with all distinguished guests and to deepen the discussions on fundamental and applied R&D. 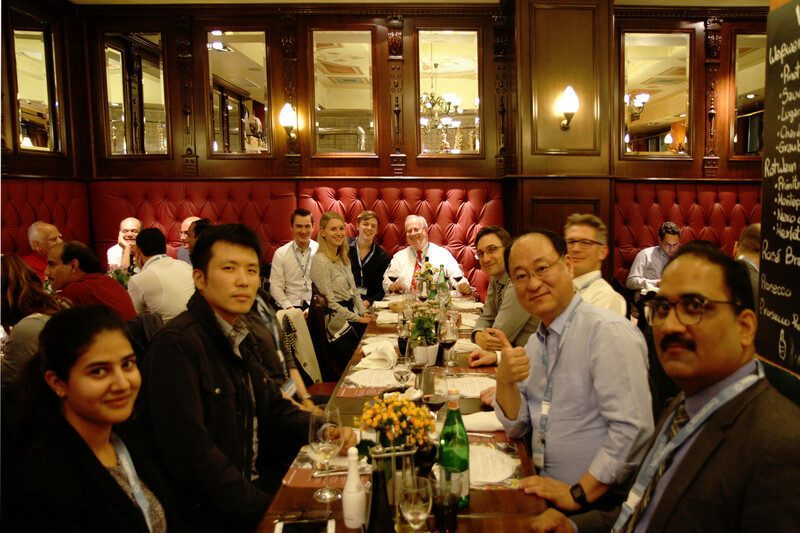 The second day ended with a networking dinner during which new models for improving the engagement of young scientists in professional activities across societies were elaborated and student exchange programs were planned. This led, for instance, to the spontaneous participation of Master students at the 61st International Colloquium on Refractories 2018 in Aachen. Think global - act local. This is the slogan of the Rhine Ceramic Chapter Germany. In order to realize this scheme, a focused workshop between the research group of Prof. Dr. Silke Christiansen (University of Berlin, Helmholtz Center in Berlin, Max Planck Institute in Erlangen) and Prof. Dr. Sanjay Mathur was organized to not only discuss and target current research challenges but to address these directly. The International Rhine Round Table was established as a platform to connect researchers from industry and academia, who are active in the field of ceramics and glass technology. Besides facilitating scientific discussions among world-class experts on the emerging trends in science and technology of ceramics materials and glass, this forum offers a common space to discuss shared interests among different professional societies in Germany, Europe and other regions worldwide to promote collaboration in research and training. Renowned international experts will participate this year to showcase their recent developments in fundamental and applied R&D, and to discuss new models for improving the engagement of young scientists in professional activities and societies. The updated program is available now! A joint workshop between the research groups of Prof. Silke Christiansen (HZB, MPL) and Prof. Sanjay Mathur (University of Cologne) will review the status of current collaborations and identify new areas and interests for joint research projects.